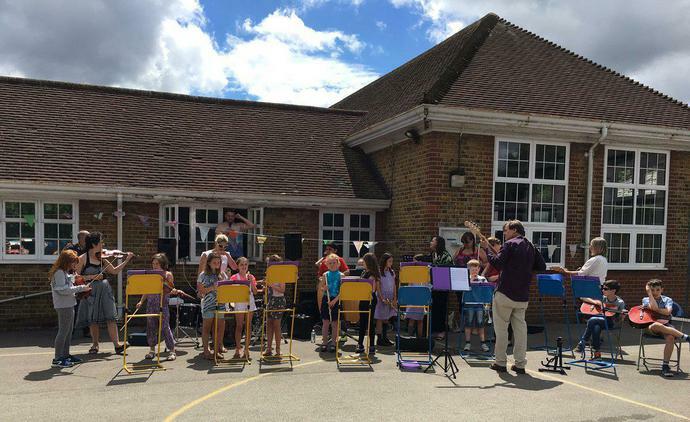 Our school band has gone from strength to strength this year! Free to anyone who would like to enjoy music-making as an ensemble, we meet every Wednesday lunchtime and have lots of fun. It helps if you can bring an instrument along and already have instrumental lessons, but we have a few places for complete beginners who would like a go with percussion or keyboards. Mr Pyne is our brilliant band leader and he writes excellent, tailor-made arrangements of a variety of songs for our musicians, including versions of Hold Back the River (which we performed with the school choir at Musicians Evening), Harry Potter Theme Tune and lots of jazzy, funky tunes. As well as having lots of fun, it is great to see the children who take part really improving their listening/ rehearsing/ concentration skills required of being in a big band. If you are musician, you would be CRAZY to miss out on this opportunity to play and learn together. It is what music is all about!